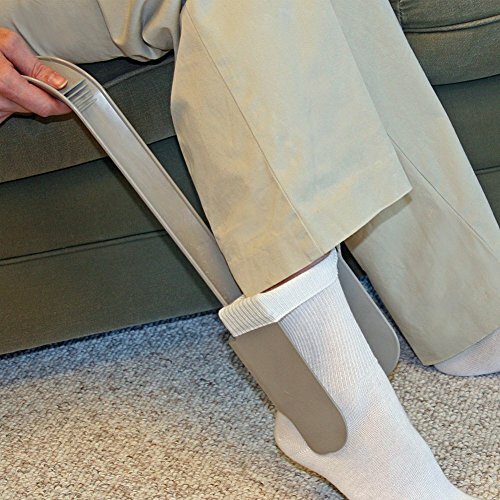 Sock Aid Deluxe Helps you put on your socks! Stop straining! Rubber grips hold your sock open so you can insert foot and pull sock up. Works on all types of socks. Also doubles as a long-handled shoe horn! Durable plastic. Approx. 17" long. Opening is 5.75" wide. Easy to use and stress-free. Rubber grips to hold open socks. Works on all types of socks. Approx. 17" long and 5.75" wide for opening. If you have any questions about this product by Sock Horse, contact us by completing and submitting the form below. If you are looking for a specif part number, please include it with your message.